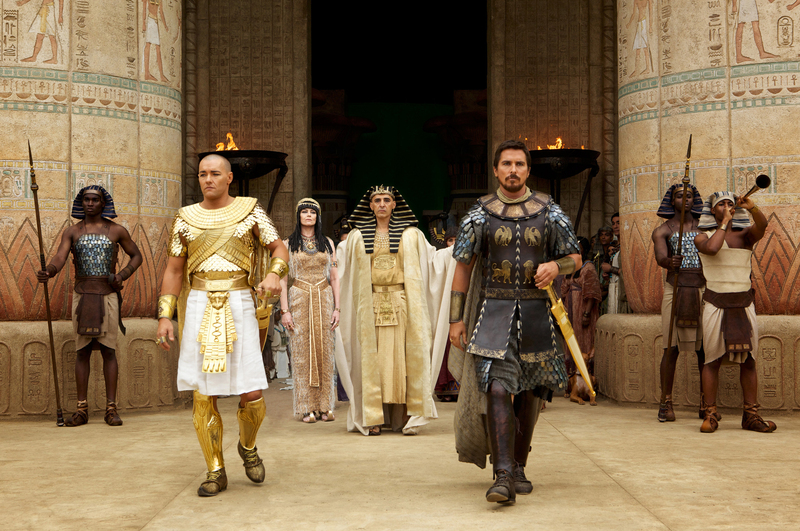 Ridley Scott directs Christian Bale and Joel Edgerton in Exodus: Gods and Kings the biblical story of Moses and the king of Egypt Ramses, bookending a year which began with another Biblical adaptation by Aronofsky’s Noah. A Ridley Scott period piece evokes great expectation after the majestic Gladiator and here too Scott manages to present a beautifully shot and exquisitely designed period piece that is unmatched in its size and scale but it is the story and the editing where this movie gets crucified. The story opens with Ramses and Moses, cousins who are told of a prophecy by the high priestess played by Indira Verma that on the battlefield a champion will survive and lead the people while the other will perish. When the said battle ensues –without preamble Edgerton’s Ramses is facing certain death until Bale’s Moses saves him. This makes an already jealous Ramses even more resentful of Moses while Pharaoh Seti continues to clearly favor Moses over his own son. This is the basis of the story, the underlying motivations which drives these characters, Moses while Egyptian still continues to display a sense of moral certitude towards the slaves while Ramses believes himself to be descendant of god and acts as a tyrannical overlord who pays no heed to the suffering of the slaves. This should have been played up even more because then the audience would have been invested in the outcomes of the lives of these two individuals. But like a bored storyteller Scott relies on the knowledge of the audience and lazily keeps pushing forward to the eventual conclusion. The time lapses are also abrupt and feel rushed. But the movie does have very strong points that prevent it from becoming an absolute bore. The scale of production is enormous, the royal city of Memphis, the slave town of Pithom are of an unimaginable proportion. The costume designs are exquisite. And while Sigourney Weaver’s talents are entirely wasted as an actress here, she is given beautiful headdresses. 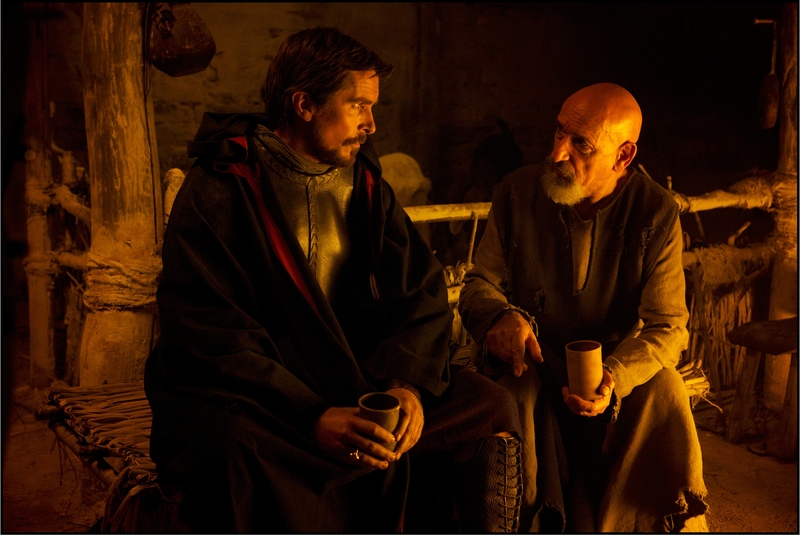 Christian Bale as Moses is wonderful as is Isaac Andrews who plays Malak the boy who relates the wishes of god Moses by the burning bush. There is a sense of impending calamity every time Malak and Moses converse and it is credit to the little guy to be able to convey that while talking down to Batman! The cinematograph by Dariusz Wolski is spectacular and one scene in particular during the exodus had be gasp out loud at the stark beauty of the landscape – I thought to myself this must be Deakins – and that comparison is praise enough. The fight sequences and the panoramic shots of Memphis, Pithom, and the red sea are all brilliantly shot and looked beautiful and clear in 2D. The music by Alberto Iglesias is quite and complementary for the most part but at certain points he gets injected with a bit of Zimmer and it goes overboard but it does well to underscore the action sequences. Scott has made it known publically that he wanted to make a movie on a biblical story based on plausible scientific explanations. He tries to espouse those theories to justify the plagues of Egypt and it gets repetitive. Had he spent less time with the multiple plagues of Egypt and more time developing the characters of Moses and Ramses and focusing more energy on the undercurrent of jealousy it would have been a better story. There is however a 4 hour final cut of the movie which hopefully does this and I for one will be watching that because even with its flaws this is a movie that isn’t shy from taking a stand and making commentary, the scene at the end of the exodus between Moses and Joshua speak of the conflict in the middle-east at present. This is a sandal and sword movie done intelligently and that is reason enough to want to watch it.